B. Stevens, The Collector's Book of Snuff Bottles, no. 339. The Brown Stonewares of the Yixing Kilns. The Carol Potter Peckham Collection, p. 65, fig. vi, left. Yixing in Jiangsu province to the west of Shanghai is associated with a very distinctive type of stoneware. It is usually purplish-brown, hence its reference in Chinese as "purple clay" ware, but its color can vary greatly, ranging from pale beige, to brown, to green. It has been produced for nearly a thousand years in the same place, but came to artistic prominence only in the 16th and 17th century (during the late Ming dynasty), when the scholarly classes found it a suitable material for teapots and other scholar's articles. The snuff bottles are usually left plain, painted with slip designs, carved or enameled. Although the enameled versions are obvious folk-art, they follow the tradition of literati painting in their subject matter and mode. The subjects were, no doubt, inspired by the rivers, lakes and mountains of Jiangnan (South of the River) area in which Yixing was situated and where so many of the literati lived. 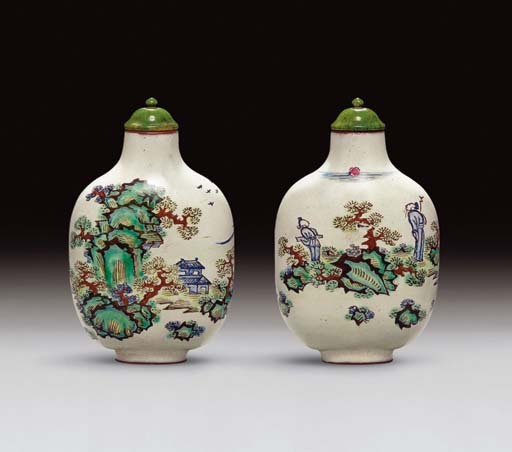 Although the style is different, the choice of subject matter links the enameled wares with those decorated with slip designs, such as those illustrated by Moss, Graham, Tsang, The Art of the Chinese Snuff Bottle. The J & J Collection, nos. 253-5, and in L.S. Perry in Chinese Snuff Bottles. The Adventures and Studies of a Collector, p. 77, no. 51.